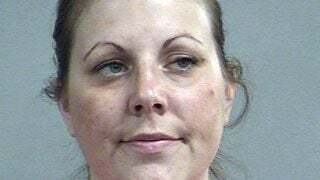 LOUISVILLE, Ky. (WDRB) -- Louisville Metro Police say they've arrested a woman after she drove while intoxicated with a 4-year-old girl in the vehicle. According to the arrest report, officers were called to the corner of New Cut Road and Southside Drive Thursday just before 4 p.m. after an accident took place there. Police say when they arrived, they found the driver of a blue van, 35-year-old Amy Longaker, outside of the vehicle, having a difficult time standing up. She allegedly had trouble answering questions and told police she took Tramadol (a painkiller) in the morning and Lyrica (another painkiller) two hours before the collision, according to the arrest report. Police say Longaker gave them permission to search her purse, and they found two more prescriptions inside. All four prescriptions had warnings on their containers indicating that the medications caused drowsiness. Officers allegedly found hydrocodone pills and a baggie of suspected marijuana. Longaker had no insurance on the vehicle and was driving on a suspended license, according to police. There was also a 4-year-old girl in the vehicle at the time, police say. Longaker was arrested and charged with driving under the influence of alcohol or drugs, wanton endangerment, possession of a controlled substance, possession of marijuana, failure to maintain required insurance, driving with expired registration tags and driving on a suspended operator's license.